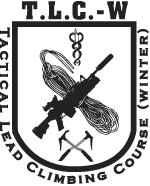 Tactical Lead Climbing - Winter - S.E.I. TLCs are held in New Hampshire’s Mount Washington Valley near North Conway. Attendees will be lodged at one of several SEI-designated conference facilities which provide all expected amenities. Air travel is to Portland ME, Manchester NH, or Boston MA. Length of course is 10 academic and field days. Field over-night training operations will not occur, although there may be sustained-period training exercises. Logistical support of this COI requires full per diem for Carroll County, NH. Specific lodging and meals arrangements and requirements are designated by SEI. All SEI-specific personal and professional gear and equipment must be provided by the attendee. Day 1: Knots, protection belay anchors, station management; practicum. Day 3: Descents, lowering, rappelling, rappelling transitions, etc. Day 4: Lead considerations, aid climbing techniques, protection, traverses, rope drag, etc. Day 5: Route-finding, time management, climbs with tactical loads, etc. Day 6: Short-roping, short-climbing, etc.